The Orange Bulborb (テンテンチャッピー?, lit. : "Dotted Chappy") is an enemy in Pikmin 2 and Pikmin 3. It has a general Bulborb appearance, but has black skin, yellow bloodshot eyes, and its backside is orange with black spots, the total effect making it look somewhat like a ladybug. It has the same strategy that all Bulborbs use for attacking, however, this is a unique Bulborb sub-species in that it wakes up if prey are within close range (about the range of the cursor's reach in the GameCube games), and has slightly more health, making it difficult to defeat with the traditional Bulborb-defeating tactics. It is otherwise the same as the other Bulborbs. They may be found in many places, such as the Bulblax Kingdom, or on land in the Wistful Wild, by the Dream Den. Usually when there is one of these around, it is almost sure that there may be many Dwarf Orange Bulborbs around. 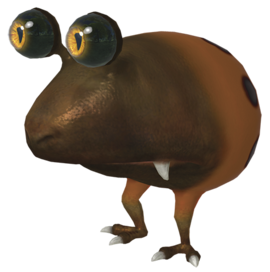 In Pikmin 3, the creature is much more rare, appearing only 4 times throughout the main story. Here, they have physical differences such as their head and face being more brownish. Their pupils have gained a more triangular shape as well. In some Mission Mode stages, they can be found near Clovers, but regardless, they will still be able to see prey hiding under any plant. “Orange Bulborbs are similar to standard Bulborbs, but they’re considerably tougher. These creatures tend to sleep in tight spaces, making it difficult to flank an Orange Bulborb without it noticing. If a large group of Purple Pikmin is available, simply rain them down on the Orange Bulborb. Even with the Bulborb's head start, the purples will have a good chance of stunning it with serious damage, and hopefully defeating it without losses. Orange Bulborbs are tricky without purples. It's never wise to attack a large grub-dog from the front since they'll almost surely bite back, and since the Orange Bulborb will wake up before it can be attacked clearly, it will be highly troublesome. If it is approached from the back, quickly run and rain Pikmin on it. It can then be defeated like any other Bulborb. If there is no choice but to approach it from the front, dismiss the Pikmin and use a leader to wake it up. Let the Bulborb chase them until it runs out of its range. When it goes back to sleep, attack it in the back. Orange Bulborbs also have a slight delay in between its "yawning" sequence and waking up again, so use this opportunity to pummel it with Pikmin. In Pikmin 3, the Orange Bulborb retains all of its trait from Pikmin 2, but due to the lack of Purple Pikmin in Story Mode and the fact that the hiding strategy with Clovers does not work, it can be much tougher to defeat. However, there are other strategies players can use now to take it down. Firstly, the front of the Bulborb is much more vulnerable due to the eyeballs of the Orange Bulborb being a weak point. If one is hit, it will cause the Bulborb to recoil (and spit out any Pikmin that it has eaten). Secondly, all Pikmin can hold bomb-rocks, allowing them to be used to defeat the Orange Bulborb quicker. Finally, instead of using Purple Pikmin, Rock Pikmin can be used instead to pummel the Bulborb. The only Orange Bulborb that is required to take down is the one in the Tropical Wilds; the group of 3 near the Portable Sunset in the Twilight River can be left alone. The one in the Tropical Wilds is facing away from the gate, so Bomb Rocks are recommended. Alternatively, the Bulborb can be awoken, and if the player runs away fast enough, it will go back to sleep facing the wall, allowing for an easier attack. Orange Bulborbs are distinguished from the remaining Bulborbs by being orange, hence their name. Their Japanese name is テンテンチャッピー?, in which テンテン? means "dotted" and チャッピー? (lit. : "Chappy") is Japanese for "Bulborb". Their scientific name is Oculus kageyamii orangium; Oculus kageyammi is the species name for the Bulborbs, and orangium is similar to the English word "orange". Internally, they are called bluechappy in Pikmin 2, due to the fact that during development, yellow and blue Bulborbs were planned to exist, but over time, the blue Bulborb got changed into the Orange Bulborb. In Pikmin 3, this enemy is internally recognized as being the same as the Red Bulborb, so its internal name is chappy, but when it needs to be distinguished, it is called tenten, over its Japanese name. Concept artwork of an Orange Bulborb. An example of an Orange Bulborb. Orange Bulborbs sleeping in Pikmin 3. Brittany being pursued by a Bulborb. An Orange Bulborb exploding after eating a bomb rock. Notice how it turns blue. Close-up of an Orange Bulborb, ready to chomp. The creature's e-card, #03 (2nd blue card). In Pikmin 2, although an Orange Bulborb will wake up from having a leader or Pikmin pass by close, it will not wake up if a Spotty Bulbear bumps against it, as is the case with other grub-dogs. This can be seen in sublevel 9 of the Hole of Heroes. This page was last edited on March 25, 2019, at 17:13.